There are a couple of plot themes I chose never to explore. When our book buyer strongly suggested this title I dragged my feet. I foisted my copy on to a friend who trusts and reads my recommendations. When I started getting feedback from others I encouraged her to put it on the top of her pile. The week before Christmas she texted me that she had put the holiday on hold until she finished this title. Her strong reaction pushed it to the top of my pile and I spent my holidays reading this "page turner". A satisfying roller coaster of a read! Don't miss Tim Johnston's new novel, The Current, coming January 22, 2019! The Rocky Mountains have cast their spell over the Courtlands, who are taking a family vacation before their daughter leaves for college. But when Caitlin and her younger brother, Sean, go out for an early morning run and only Sean returns, the mountains become as terrifying as they are majestic. Written with a precision that captures every emotion, every moment of fear, as each member of the family searches for answers, Descent races like an avalanche toward its heart-pounding conclusion. 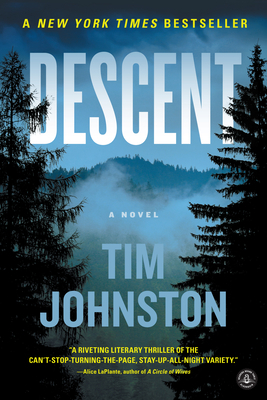 Tim Johnston, a native of Iowa City, is the author of The Current and the New York Times bestseller Descent, as well as a young adult novel, Never So Green, and the story collection Irish Girl, winner of the Katherine Anne Porter Prize in Short Fiction.